Greek former Prime Minister Lucas Papademos and his driver were injured after an explosive device went off in a car, media have reported. Papademos also once headed the Greek central bank.Former Greek Prime Minister Lucas Papademos was "seriously hurt" when an explosive device went off in his car in central Athens on Thursday, state news agencies reported. State TV ERT said Papademos´ driver was also badly injured in the explosion and that both men had been rushed to a nearby hospital. It said Papademos was wounded by a letter bomb while reading his post in the back of the car. "We are shocked. I wish to condemn this heinous act," Media Minister Nikos Pappas told the station. State news agency ANA said Papademos was undergoing surgery for abdominal and leg injuries. Authorities said Papademos´ injuries were not life-threatening. 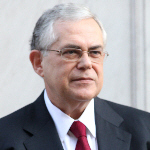 Various high positions Papademos, 69, was prime minister of Greece from November 2011 to May 2012 at the height of Greece´s debt crisis. Previously, he served as governor of the Bank of Greece, then as vice president of the European Central Bank up to 2010. There was no immediate claim of responsibility for the blast. In March, a secretary at the International Monetary Fund in Paris was injured by a letter bomb sent by the Greek anarchist group Conspiracy of Fire Nuclei. The group, considered a terror organization by Washington, also sent letter bombs to foreign embassies in Greece and to European leaders in 2010. On Tuesday, an envelope containing bullets and addressed to Greece’s general secretary for public revenue was intercepted at a post office branch in Athens.